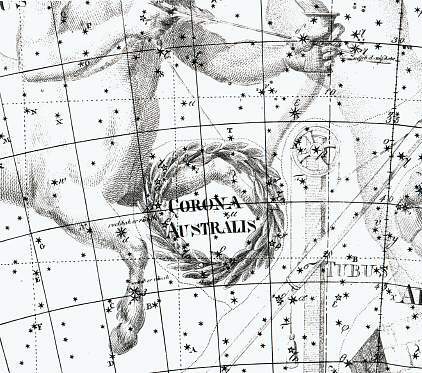 Corona Australis is one of the least defined of Ptolemy’s 48 constellations when it comes to Greek mythology, and with a name in Greek that means Southern Wreath, or Crown, it has often been mistaken for Corona (Corona Borealis), the Crown. 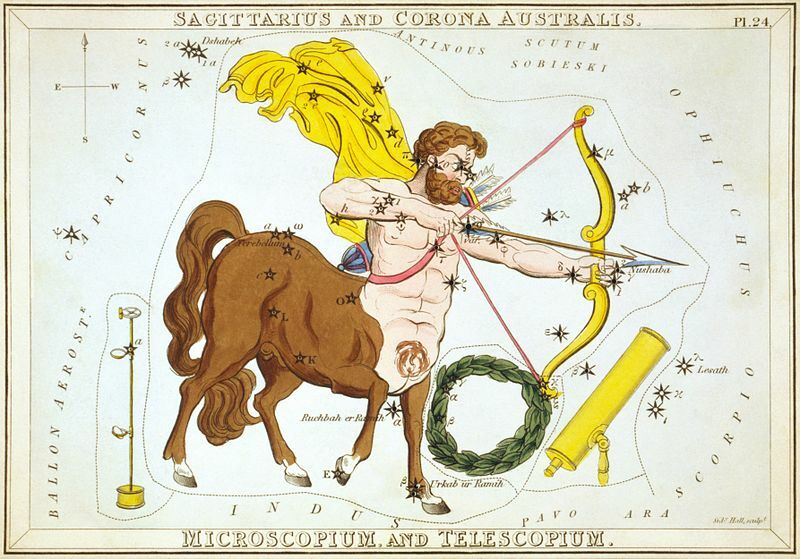 At one point the constellation was known as Corona Sagittarii suggest it was the crown of the Archer, or perhaps not a crown but instead a sheaf of arrows. More commonly though, Corona Australis is linked with the story of Dionysus, with the crown actually being a wreath made of myrtle. 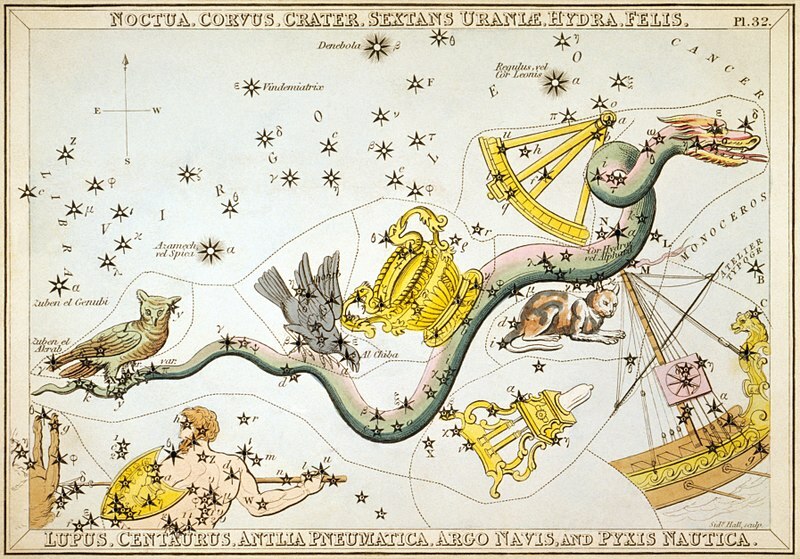 Having descended to, and returned from, the Underworld, having rescued his mother Semele, Dionysus would place the wreath in the stars as the constellation Corona Australis. Once simply known as Corona, the Crown, the constellation is now more commonly named Corona Borealis, in order that it is not confused with Corona Australis. 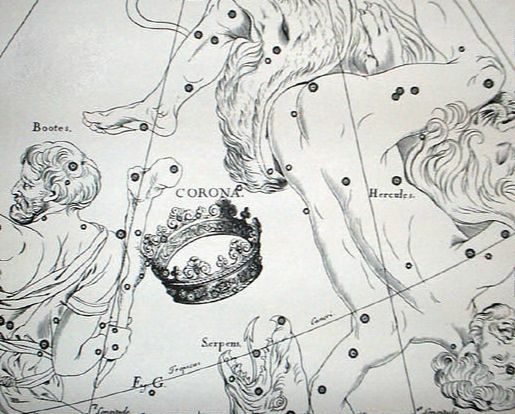 Whilst occasionally referred to as the Crown of Dionysus, this crown is normally associated with Corona Australis, and so the mythology of Corona Borealis normally revolves around Ariadne, with two tales told in Greek mythology. Some ancient writers call the Corona, the Crown of Theseus, alluding to a crown given to the Greek hero by Amphitrite as indication that Theseus was a son of Poseidon. The jewels of the crown were of such lustre that the crown allowed Theseus to navigate through the darkness of the Labyrinth as he sought out the Minotaur. Theseus would subsequently give the crown to Ariadne as a thank you for her assistance, after which it was placed amongst the stars. 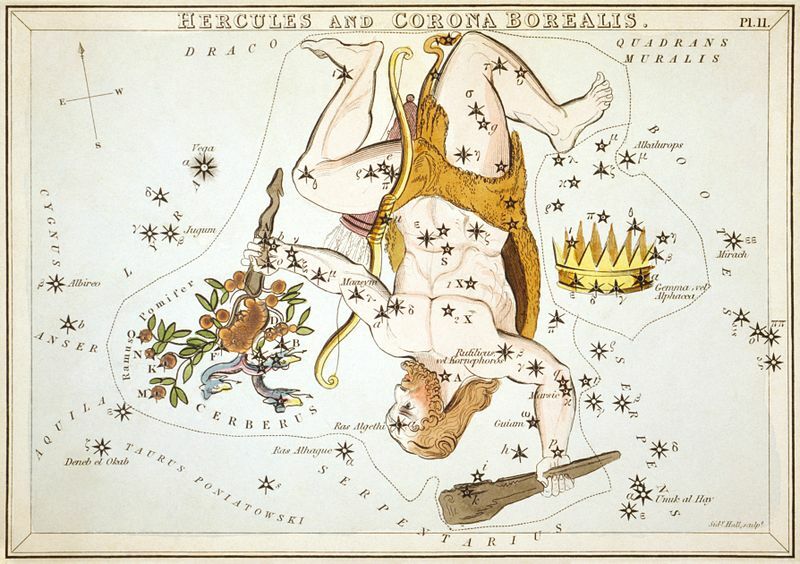 Alternatively, Corona Borealis is the Crown of Ariadne, given to the daughter of King Minos by the gods, when Ariadne married the god Dionysus; and thus, Dionysus placed the crown amongst the stars. Corvus, the Crow, is a constellation described by Ptolemy, and in Greek mythology, two tales are told about the appearance of the crow in the night sky, with both stories involving the god Apollo. One story tells of how Apollo was in love with a mortal woman named Coronis, but having fallen pregnant by the god (with the baby being Asclepius), Coronis consorted with the mortal prince Ischys. Apollo would kill his lover, but placed her amongst the stars for Coronis’ name means crow. A more common tale tells of Apollo ordering a crow to fetch water in a cup so that he could make a sacrifice to Zeus. The crow took the cup but tarried in his task for he waited for some figs to ripen so that he could eat them. To hide the fact that his appetite had caused Apollo to wait, the crow told a story of how the water source was guarded by a water snake, and even went as far as catching one to make his story more believable. Apollo recognised the lie for what it was, and so the god threw the crow, the cup and the snake into the sky, where the crow became Corvus, the cup became Crater, and the snake became Hydra. As punishment, Apollo also ensured that the crow could never drink from the cup. In the night sky, Crater is the Drinking Cup constellation, but two possibility are put forward in Greek mythology about whose drinking cup Crater is. The cup might be the cup of Pholus or the cup of Apollo, and as Crater is next to the constellations Centaurus and Corvus, both possibilities are plausible. Pholus was a centaur who some say became Centaurus, for Pholus once welcomed Heracles to partake of food and drink with him. The smell of alcohol caused a riot amongst the other centaurs, and in the ensuring battle between the wild centaurs and Heracles Pholus was accidentally killed. Heracles thus asked for the centaur and his drinking cup to be placed amongst the stars. Alternatively, Crater might be the drinking cup that Corvus the crow was supposed to fill with water for the god Apollo. 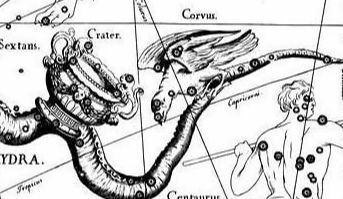 When Corvus took his time over the task, and then lied about an encounter with a snake, an angry Apollo placed Crow (Corvus), the cup (Crater) and the snake (Hydra) amongst the stars.